Coach Mike Kozlowsky: fight or die! Call Michael Kozlowsky! That advice was given to me not only wholeheartedly, but also seemed to be a very good one indeed: in New York I was looking for a man, who would be able to help me to understand a problem of young immigrants, aspiring martial arts athletes, trying to assimilate into our society. How would a teenager or a young adult – find the path of their own, to feel as comfortable as possible inside an environment – totally new, and not familiar to them. And those persons are clearly the most aggressive and spontaneous in their respectful generation. All right, I am on the phone. After some waiting, self-assured, slightly crackled voice answers me. He speaks with some obvious Russian accent – so, after I introduced myself, I switch to Russian too. My counterpart apologizes politely, and asked me to call back in ten minutes – because he needs to finish his recent session with his trainee. Of course – I’ll call later. Disconnection. Ten minutes flew away – and I am again on the phone with him. First of all, I can feel something in his voice – even over the phone, and through all that distance between us. Some puzzling does exist in his voice. A teacher? Well, perhaps – yes. In any case, I will not drop this case now – at least, before I’ll meet him face to face. And we schedule a meeting this very evening. Great! Brooklyn, the place named Gleason’s Gym. I am a little bit late – because of the usual troubles with New York subway. I hate to be late – so, I become nervous. But lucky I am tonight – and Mike sits in his car downstairs, across the street from the club, and has a conversation with a friend sitting next to him on a front sit. Perfect! The very first impression of mine was that he is a man who used to take care of the others, to be in charge and bear certain responsibility for all and everything. Absolutely on a subconscious level: I am immediately invited to take a back sit of the car. AC in the car is on, and that’s exactly what one may only wish for – in a hot and humid July evening of New York. So, I take an opportunity to watch a man behind the wheel – quietly. Here we go – meet famous “Coach Mike” Kozlowsky. This man is almost unique even for the US: he came to this country as a grown mature man (from Israel, where he already worked as a coach for at least three years), and was able to make himself, to establish a boxing school of his own, to train a lot of young athletes – not all and everyone could do it. Mike – did it all right. And I start to understand – how exactly it could happen. First of all this man is a very convincing. When he is talking, it’s almost impossible not to listen to him. He is a natural-born leader, a person whom one simply must take seriously from the very first moment. He’s got a colorful face, rich of mimics and very movable one. Long hairs – and an entire look of his would be not that of the typical boxer. Rather – some kind of an artist or a rock-star he looks like. But suddenly I imagined him on a boxing ring. Well… I wouldn’t like to get there – in a direct-hit distance from him. Finally, his friend finished a conversation, says his usual good-byes, and it’s my turn to take the front sit. So, shall we start? OK, let’s start… And from the very first minute he takes an initiative: this we will talk about – and that you’ll find on my web-site! Bravo! That’s the style I appreciate! OK, a little bit of a history. He came to Israel in 1995 – nobody cares about coaching young boxers and other athletes back in his native Russia those days; and Michael felt himself useless. Well, such was his fate – just like that of many others there, in turbulent country. But not plenty of those lost and disappointed found courage and strength to overcome, to change at least something. Michael Kozlowsky – found the way of his own. There was no way to work as a coach in Israel – during his first months over there. Everyone had to learn Hebrew, to adopt to the difficult new life and to the entirely new environment. 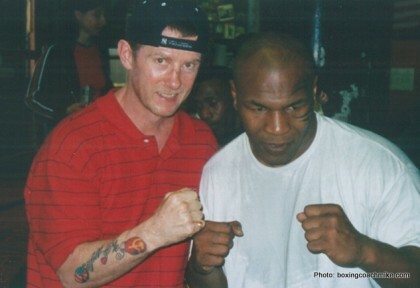 But then, to get used to this life – just a little bit – Mike started to train youngsters, to work with the schoolboys. There is no gym – nor proper equipment? Not a problem: we’ll put a punching bag on a balcony! Nowhere to train? But there is a schoolyard next door! So, that’s how he worked. He collected teenagers who liked box – and worked with them. He worked with them all his time, without sparing neither his strength nor his time. And he hadn’t no mercy – to himself. Box is not too popular in Israel, and Mike Kozlowsky was almost the first who had a youngsters’ team trained. The principal of the school where Mike Kozlowsky used to work at that time had a closer look at him, and how he worked with teens. After some time she came to the Ministry of Education and simply said that if she will not be allowed to give Mike a tenure – she will not hire other Russian repatriates – ever. So, Mike got his permanent job in that school – a tenure. It was a great achievement for a man, who came to Israel as an adult. And about the same time a very interesting teenager appeared. His name was Yuri, Yuri Kuzmin then – later he changed it to Yuri Foreman. (He also changed his religion – but later. In the US.). So, young Yuri became one of the Mike Kozlowsky’s favorite pupils. In a year 1997 Mike Kozlowsky’s team won the first prize on Junior Championship of Israel – with flying colors. Four gold and one bronze medals – not bad at all! At that time people started to consider Mike Kozlowsky and his team pretty seriously. The very same year, another pupil of Mike Kozlowsky, Anton Amirov – became a champion of Israel in a category less than 67 kilograms. So, how is it – to control those aggressive and self-assured youngsters; to be their natural leader? And – how’s that – to coach the kids obviously tough by definition, and for sure – with all their complicated characters and life-stories. Michael was able to handle those problems – perfectly. Not only to be a coach for them on the ring – but also to build a real bond with them in real life; to become the ultimate Teacher for all of them. Sixteen years old Roman Greenberg (future Lion-of-Zion, one of the best heavyweights and one of the most prominent Jewish boxers) lived in his house in Haifa. Michael helped Greenberg to rebuild himself – after serious psychological downfall. And – again! – a victory! In a year 1998, in Yurmala (Latvia) Roman Greenberg won a silver medal as a semi-heavyweight among juniors. And what about Yuri Foreman (a.k.a Kuzmin)? In November, the very same year, Yuri won two fights in a row in Argentina and reached a quarter-final of that championship. Right there, in Buenos Aires, Mike’s pupils met the US National Team – Americans lost almost 90% of all fights, and won only one bronze medal. During his three and a half years in Israel, coach Mike Kozlowsky ‘s trainees systematically won almost all the Israeli championships – in all weight categories. They also won several prestigious European tournaments. Famous Patricio Oliva, a Senior Coach of the Italian team, and a very good boxer himself mentioned that with Michael an Israeli box progressed significantly – especially during those two years he knew Kozlowsky works with them. If only Mr. Oliva get a chance to know that Kozlowsky coaches his team in the very same school-yard; and those young athletes still keep attacking an old punching bag, hanging from the ceiling of Mike flat’s balcony! Mike moves his family and himself to the United States. And again – to the completely new and tough, complicated and, sometimes – unfriendly landscape. Early summer 1999, Mike Kozlowsky began to work as a coach at the fabled club – Gleason’s Club. But back in Israel, his beloved pupil, Yuri Foreman (a.k.a) Kuzmin got himself in serious troubles: he joined a gang of unruly youngsters, and started a career of the real “tough-boy”. One day the gang attacked the wrong guy, and Yuri got himself arrested. When out of jail – on bail – Yuri immediately called his coach, Mike Kozlowsky and told him all the story. He was scared, and seriously concerned with his future in Israel – being involved in a serious violent crime, a probability to spend some time in jail for him ran pretty high. Mike didn’t hesitate a blink of a second: “But of course – come to the States, my home is always open to you!” And Yuri jumped the bail in Israel, used his second passport, and came to the States. Mike met him immediately, and brought him to live in an apartment which he shared with his own family. Yuri became not only a pupil – but also a family member of Mike. In a year 2000 Yuri Foreman participated in a highly-prestigious competition “The Golden Gloves”. For the last seventy years that particular competition is one of the most famous US boxer’s competition among amateurs. He was defeated only once by the member of US Olympic Team, Luis Collazo – during his final fight of that championship. (Later Luis Collazo became a champion of the world among the professionals). Another Mike’s pupil, Jill Emery, got her Golden Gloves there and then – she became a champion. Much later she will give them to her first coach, Mike – as a gift and for a good memory. She’ll win three more Golden Gloves tournaments. And what about Yuri Foreman? The same year, in Detroit, he won a bronze medal – in the National Golden Gloves tournament. Everything looked all right – but Mike’s wife just smelled something really wrong. “Wait and see – he will betray you when he’ll achieve something serious! You’ve better to send him back to Israel – to face his criminal charges!”. Finally. Mike’s wife lost all her patience, and asked him to choose between his pupil and his family. Well, can you find many Teachers who would choose a pupil? Mike did, and get himself a divorce. He rented another apartment, in the same neighborhood and moved there with Yuri. With his pupil. About this time, in Gleason’s Gym, Mike introduced his favorite pupil, Yuri Foreman to Leyla Leidecker – an aspiring model, and an amateur boxer from Hungary. Later Yuri will marry Leyla. It was she, Leyla – who brought Yuri to the Rabbi in Brooklyn – to make him a giyur (mandatory ritual in order to be considered a real Jew). Well, as we already mentioned above – it’s not enough to change one’s last name to become a Jewish. Religion must be changed too. And to make a Jew out of Russian boy is more convenient in America, of course. Yuri’s future wife realized almost immediately that it’s a very good for his image – to become an Orthodox Jew, following all the traditional rituals. Seems to be unusual – therefore, it could work as a strong PR-move. Why not? Even not that expensive it was! The Foremans became Jews, and immediately started to build an image for themselves. That’s when Leyla said to Mike: “Well, perhaps you’re a good coach – but you don’t know a thing about show business!”. The Teacher (if the real one he is!) simply cannot betray his pupil – he will not be a teacher then. But it happens all the time – vice versa. But still – everything goes fine; and in 2001, at Madison Square Garden, Yuri Foreman won his Golden Gloves. That was a real sensation! Just think – for the very first time, the Russian-born youngster became a champion – and his coach was Russian too! But then… Then was a very strange autumn of 2002. And Yuri Foreman came to his Teacher, and told him that he must go. In a minute his Teacher became nobody, and had to get lost. He, the great Yuri, must move on – and there is no room for Mike in his corner anymore. Just because Mike Kozlowsky is not the name for America. Well, the “Rising Star” got sick with a star-sickness. It happens all the time – right? The pupil betrayed a teacher. Everything thinkable and mostly unthinkable had happened after. Even two Federal Agents visited Mike’s apartment, and interrogated him – because Yuri Foreman claimed that Mike Kozlowsky was no one but the Godfather of the Russian Mafia. After very tough two-hour long interrogation the feds leaved Mike with a restraining order: not to step into five yards distance from his former pupil, Yuri Foreman. Looks like a very unusual gratitude to me – or isn’t it? Especially, if this particular pupil claims his own deep spirituality – almost every moment possible and impossible; tells to everyone who wants to listen that his dream is to become a Rabbi one day; actively demonstrates his Jewish identity – and even has the Star of David on his boxers. Well… But life is life, and everyone moves on finally. Another Kozlowsky’s pupil wins Golden Gloves in New York again in 2003. Next year, Jill Emery wins Intercontinental Women Tournament in Tonsberg, Norwegian and gets a prestigious prize as “The best boxer of the American continent”. In 2008 she won the World Championship (version IFBA). 29 March 2012, on the arena of the world-famous Madison Square Garden, Russian coach, Mike Kozlowsky got his prize “Trainer of the Year”. It was absolutely unbelievable, for the very first time – in the entire eighty-five years of that tournament’s history, such a prestigious prize had been given to the Russian-born trainer – if not to the very first foreign-born at all. Of course, everything will be in his life: more talented pupils, and even more prestigious prizes, and Mike The Coach will have a lot of gifted young pupils. But… why his heart still feels that old wound? Perhaps, because the treason – and especially, when your own pupil becomes a traitor – cannot be forgotten and forgiven? But he will move on. He will survive – no matter what! His pupils need him! And everything will be just fine for The Coach Mike! Next boxing news: Shane Mosley vs. Amir Khan on December 7? You are here: Home / Boxing News / Coach Mike Kozlowsky: fight or die!